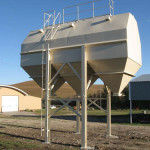 FCS Manufacturing was created out of a desire to fill a niche need in quality built, made to order Overhead Feed Bins. 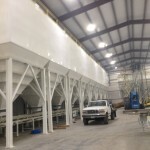 With market needs continuing to grow and diversify, quality built custom designed storage bins are still very important to the agriculture market. With our in-house engineering staff, this allows us the flexibility to quickly design and draw up specs for a new project. We believe that we can bring value to your project in building, and designing the perfect solution for you and deliver the completed product ready to set in place and perform. Proper ventilation is key in loading, and unloading bins. 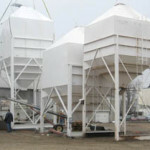 We offer multiple sizes for proper bin ventilation. Sticky materials such as DDG and Soybean meal require a steeper angle for better product flow. We offer hopper slopes up to 60 degrees. The hopper discharge can be configured to align with what ever location needs to be met: over mixer/grinders, or to align with Auger trailer compartments for one stop filling. Blower pipe for pneumatic fill. Bean Ladders and other seed handling accessories. We offer any size from 12 to 24 inches square or even rectangular doors for over grain cleaners/scalpers. Leverage slide, Rack and Pinion, Roller gates, Air and Electric. We can design and build transitions for bins with more than one door. When a bin is divided into more than one compartment a transition is often desired to keep the material flow coming out of one place. Door socks easily slide on and off the bottom door. 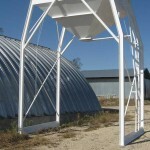 They help reduce loss of feed in filling a cube feeder that is lower to the ground. This bucket chute runs along the ladder, and is just a couple feet off the ground making it simple to fill a 5 gal. bucket. To give proper drive through width, we offer leg extensions. For all of our commercial bins, we ensure they each meet OSHA safety standards. Any ladder over 7′ off the ground must have a ladder cage. Standard landings measure 24″ x 32″ and are located 8ft. above ground next to ladder. 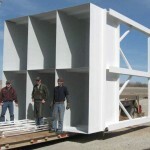 They provide additional safety for operator when loading grain trucks and semis. We offer the “LevAlert” bin level indicator as an option. 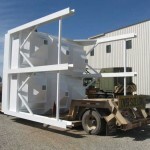 We strive to be your go-to Partner in Custom Designed Square bins.